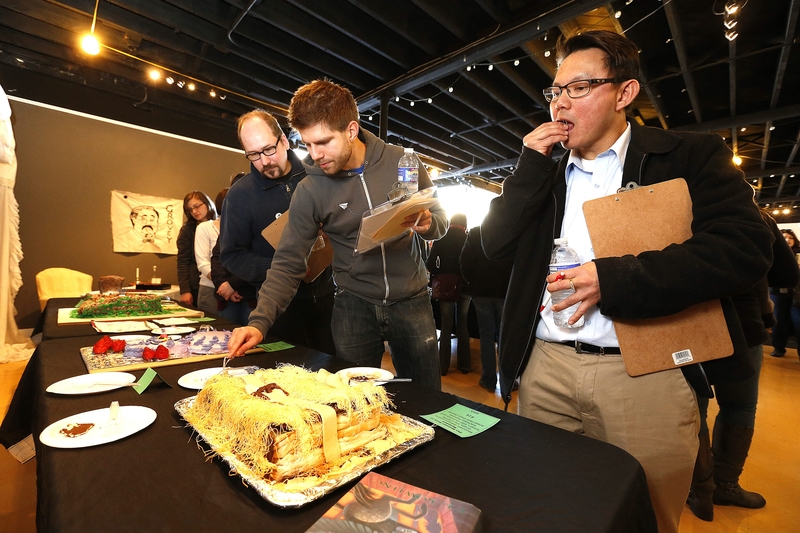 From left, Richard Kegler, Alex Levine and Kevin Lin, judge the entries at the Edible Books day at Western New York Book Arts Center on Sunday, March 30, 2014. As attention-grabbers go, the sentence uttered Sunday afternoon by Chris Fritton as he stood atop a chair near the entrance of Western New York Book Arts Center, turned some heads. “No eating of the books,” Fritton told the people attending the Edible Book Festival. The international Edible Book Festival is an event that takes place annually on or around April 1. Participants create edible books that are exhibited, documented and then consumed. Similar events are held in Australia, Brazil, India, Italy, Japan, Luxembourg, Mexico, Morocco, The Netherlands, Russia and Hong Kong. As studio director of the book arts center, Fritton operates the letter-press print shop in the basement and curates exhibits. Fritton’s “Romaine & Julienne” was a two-part entry that featured a starburst of romaine lettuce leaves with a red bell-pepper heart, and julienned lunch meat and cheese arranged in the shape of a heart. “The South Peeps Diet” was a chocolate espresso-coconut milk cake topped with graham-cracker crumbles that resembled a beach that was populated by marshmallow bunnies. “The Monster Book of Monsters,” crafted from baklava, nuts, chocolate and marzipan, was an early favorite of one of the judges. “Peter Pan (cake)” a vegan entry, was built from pancakes, vanilla frosting and licorice. “Snacktastic Mr. Fox,” based on Roald Dahl’s “Fantastic Mr. Fox” was a cake decorated to resemble a fox. Victoria Harms, 15, from John F. Kennedy High School in Cheektowaga, frosted the cake that became “Charlotte’s Web.” It was one of her school’s three entries. Richard Kegler, who founded WNY Book Arts Center six years ago, is now artistic director emeritus. As one of the judges, Kegler was credited with bringing the Edible Book Festival to Buffalo. Kegler said April 1 was chosen to commemorate the birthday of French gastronome Jean Anthelme Brillat-Savarin, who wrote “Physiologie Du Gout” (“Philosophy of Taste: Meditations on Transcendental Gastronomy”). Program director Khrista Tabak said the festival encourages people of all ages to use a medium they may not have considered to create art. Charles Saunders and Mary Simpson of Allentown have attended the festival in previous years. Simpson, the executive director of the Carnegie Art Center in North Tonawanda, said the event is always on the couple’s radar.